The Soap Factory presents Rethinking Public Spaces project, Trestle Support Systems, by Pete Driessen at the Northern Pacific Rail Yard site in Brainerd, Mn. Created with red pine wood and metal hardware, Trestle Support Systems is a solo public art project presenting two monumental site specific installations, Trestleand Trestle Worker, reflecting the architectural spatiality of the former rail yard spaces, referencing empowerment of the past community worker, and utilizing ideas of affective stimuli, physical embodiment and rural vacancy. Just off the Northern Pacific roundhouse courtyard in the Blacksmith Shop where the trains ran lengthwise through the building, Driessen has created an interior, site-specific abstract wooden sculpture installation, Trestle and its connection to the physicality of the interior train tracks, rail ties and site detritus. Trestle physically explores the emblematic rail transportation support form, the trestle as figural representation, and expands the spatial vernacular of the Northern Pacific site as a sculptural and public art space. 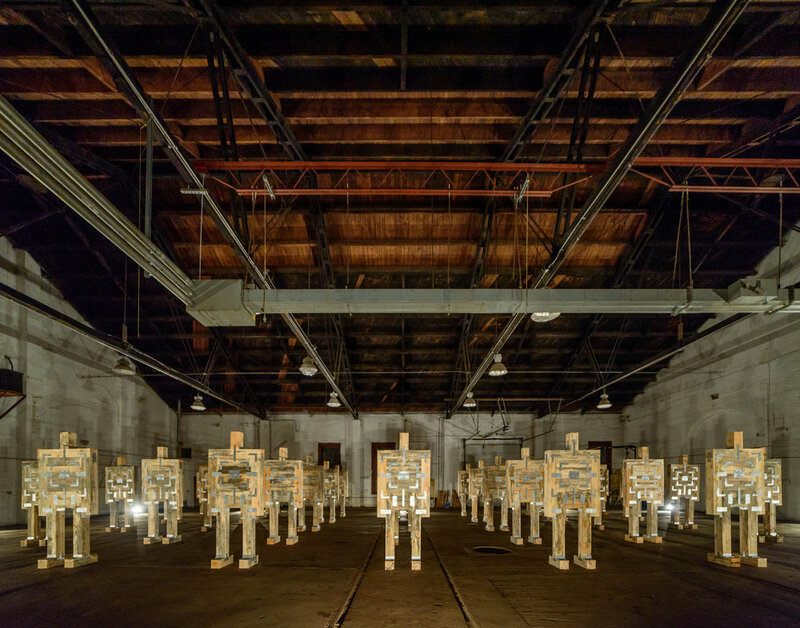 Utilizing the Northern Pacific Boiler Shop as a process studio space and independent alternative gallery space, Trestle Worker embodies 35-train car laborers aligned with the architecture of the former work site. The installation references imagery from the Crow Wing County Historical Society & Museum of the daily working ecosystem of the former Northern Pacific site. 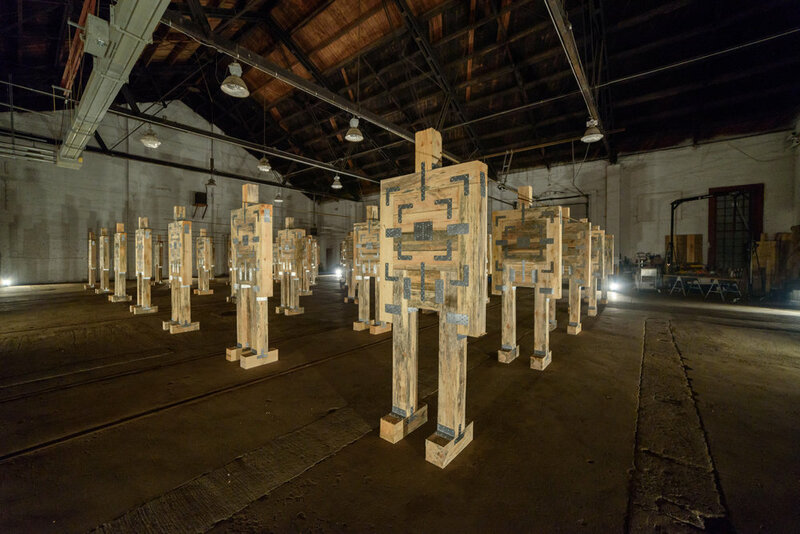 The individual Trestle Worker sculptures collectively illuminate the former worker assembly line and the union of workers laboring over the large train car production. Trestle language, semiotics and symbolism are synonymous with current creative placemaking trends of bridge building, bootstrapping, sustainability and empowerment. As a public art project in the making, Driessen tactically collaborated via economic exchange with participatory Brainerd individuals, businesses and institutions, often setting up creative initiatives as part of the large conceptual project. Inclusive was a community children’s Trestle Empowerment Workshop that focused on the 6 C’s of Empowerment: Competence, Confidence, Connection, Character, Caring and Contribution. Listen to the artist interview about the project here. Twin Cities based visitors can catch a bus to the event from The Soap Factory at 2pm the bus will leave Brainerd at 8pm. Sign up to take bus here. October 29th, Artist Dialogue and Tour with the artist, Pete Driessen; art critic and curator, Sheila Dickinson; and sound artist, Michael Masura Flora at 1 pm. Wednesday, October 25th – Saturday, November 4th – 11am-6pm and By Appointment. Closed Monday, October 30th. For the two installations at the Northern Pacific Site, Driessen commissioned sound artist Michael Masura Flora to compose two sound works to accompany the large sculptures in the massive spaces. Both sound works were influenced by the idiosyncratic components of the architecture and site. The sound compositions that were recorded within the architectural spaces themselves are meant to be physically supportive and sensually immersive, while promoting the affective experience of the viewer within the installations. The initial sound composition for the longer Trestle sculpture is lingering and evocative, while the sound orchestration for the Trestle Workers installation is arranged as a more rhythmic and playful composition. Pete Driessen is a Minneapolis based multipractice visual artist, curator, and cultural producer who creates abstract and sociopolitical paintings, mixed media ship fleets, found object installations, conceptual art statements, interdisciplinary public art, and performative participatory projects. Driessen received his MFA from Vermont College of Fine Arts, Montpelier, VT, and BA from the University of St. Thomas, St. Paul. Pete was recently named Minneapolis City Pages 2015 Artist of the Year, and has been awarded numerous regional grants and awards, including a 2015 Jerome/FSP Fellowship at Franconia Sculpture Park for his Franconia Boat Tower project, a 2014 MRAC Next Step grant for his Silverwood Park sculpture project, and two MSAB Artist Initiative grants (2017, 2013). Pete’s exhibition record includes national and regional solo and group exhibitions at a wide range of venues. He currently directs and curates a hybridic, experimental garage-based gallery known as TuckUnder Projects that specializes in emerging and midcareer artists focusing on conceptual visual arts practice, curatorial projects, and institutional critique. The Northern Pacific Railroad yard is a large historic grouping of 12 brick and wood beam buildings that sit on a colossal 47-acre plot of land in Brainerd, MN. The massive industrial site contains the aesthetic atmosphere and former physical workings of the past turn-of-the-century railroad era. The old railroad Blacksmith Shop building is 50,000 square feet, with 20-foot high sidewalls, an 80-foot wide cross span, and concrete floors. Listed on National Register of Historic Places and a former EPA Superfund site, the NP setting is centrally located near the geographic center of the state. Both the industrial rawness and the monumental scale of the Northern Pacific site and its Blacksmith Shop space are reflective of Minnesota’s architectural history and our current need for regional creative public arts. Pete Driessen is a fiscal year 2017 recipient of an Artist Initiative Grant from the MN State Arts Board. This activity is funded in part by the MN State Legislature from the State’s Arts and Cultural Heritage Fund with money from the vote of the creative people of MN on November 4, 2008. This project is supported and presented as part of Here & There: Rethinking Public Spaces, The Soap Factory’s 2017 public programming. Rethinking Public Spaces presents artist projects that enliven underutilized spaces throughout Minnesota, rethinking public space and considering what it means to place-make through a contemporary, celebratory, and critical lens.